The new delivery system equipped with pass through dose calibrator is an automatic measurement and extraction system for vials and syringes. The system can be integrated in dispensing hot cells for production of radiopharmaceuticals. The system is based on a special patented ionising chamber that allows the passage of the vial or syringe without the limits imposed by the “well” solution. 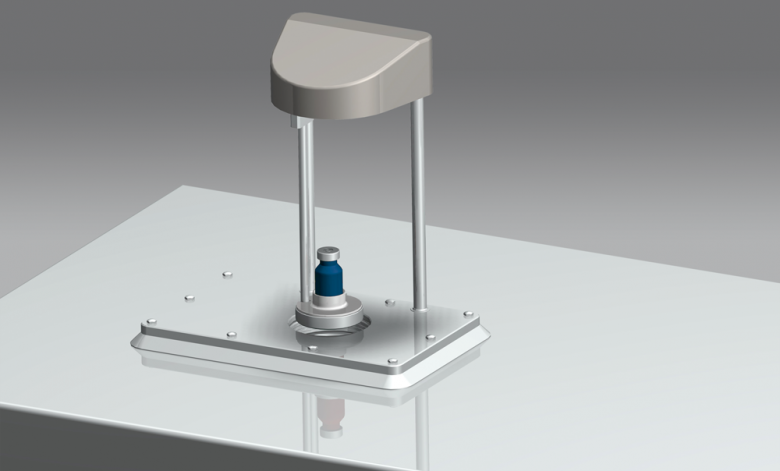 The “pass through” ionising chamber allows a unidirectional flow along the axis of the object being measured. The chamber has been designed to obtain the same measurement precision of a normal ionising chamber; this way, a measurement process equal to a solution with traditional calibrator is obtained. The integrated system allows you to perform one measurement step and then a delivery step of the vial or syringe in one single automatic cycle. The system manages this sequence in two separated and insulated chambers. The first chamber is ventilated and classified B. A plastic duct in the first chamber allows you to obtain the insulation and classification without the dose calibrator affecting the measurement. 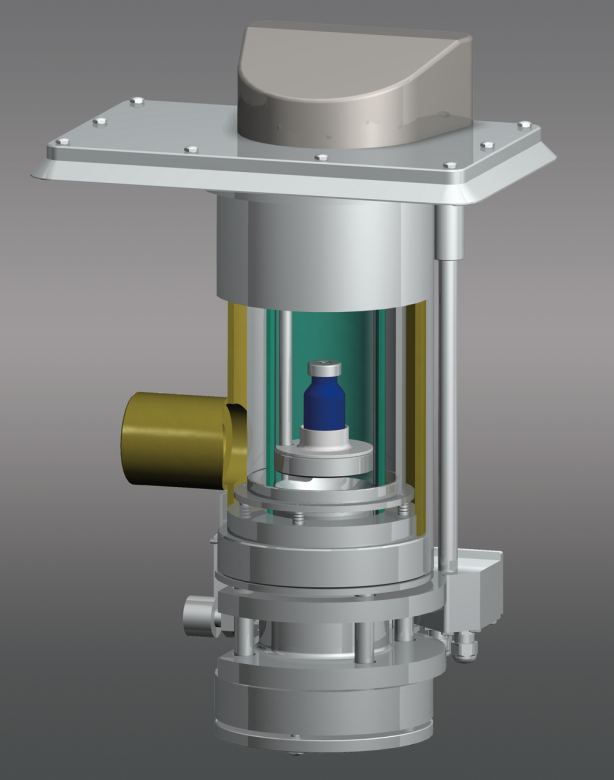 When the vial is in the measurement position, a system of inflatable gaskets insulates the measurement compartment from the main dispensing chamber. The ventilation system is independent and represents an airlock, which allows the vial discharge according to the GMP work flow. Moreover, the presence of VHP or other decontaminations do not affect or compromise the materials available in this compartment. Once the measurement has been carried out, you can request the vial discharge towards the shielded container. In this case, the valve underneath the vial or syringe opens to allow the passage of the object towards the shielded container. The compartment containing the lead container is insulated from the outside (laboratory or packaging area) and classified C. A series of interlocks allows you to open the compartments in sequence and after a suitable recovery time, in order to avoid a back-contamination towards the highest classified environments. The shielded container can be removed from the delivery system and the operator can transport it outside the laboratory or packaging area. Upon the request from the operator, the vial can be removed from the measurement compartment instead of proceeding with the discharge. The lifting system can proceed discharging, but it can also return to the dispensing area upon request. This way, the calibrator dose can be used as a normal ionising chamber. Moreover, the calibration and daily quality control procedures are easier to carry out. the calibrator exploits the benefits of the Veenstra measurement system, i.e. the connection with VDC-505 panels and the perfect integration with Comecer’s dispensers. The integrated dose calibrator with automatic vials and syringes delivery system can be installed inside a Comecer hot cells model Talia ,BBST COMBO and BBST PC.